Flooding Forces 100,000 From Their Homes In Calgary, Canada : The Two-Way In some smaller Canadian communities, the damage is breathtaking. One video shows an entire home being dragged by a swollen river. More rain is expected today in the region. Houses damaged along the edge of Cougar Creek in Canmore, Canada. Widespread flooding caused by torrential rains washed out bridges and roads prompting the evacuation of thousands on Thursday. Because of flooding that could prove historic, authorities in Calgary, Canada, have ordered 100,000 people in 22 communities across the city to evacuate their homes. As the CBC reports, intense rain has caused flooding throughout Alberta province in Canada. More rain is expected today. "Mudslides forced the closure of the Trans-Canada Highway, isolating the mountain resort towns of Banff and Canmore.
" 'The message tonight is that we are still expecting that the worst has not yet come in terms of the flow,' [Calgary Mayor Naheed] Nenshi told CBC News early Friday in a telephone interview from an emergency operations centre." 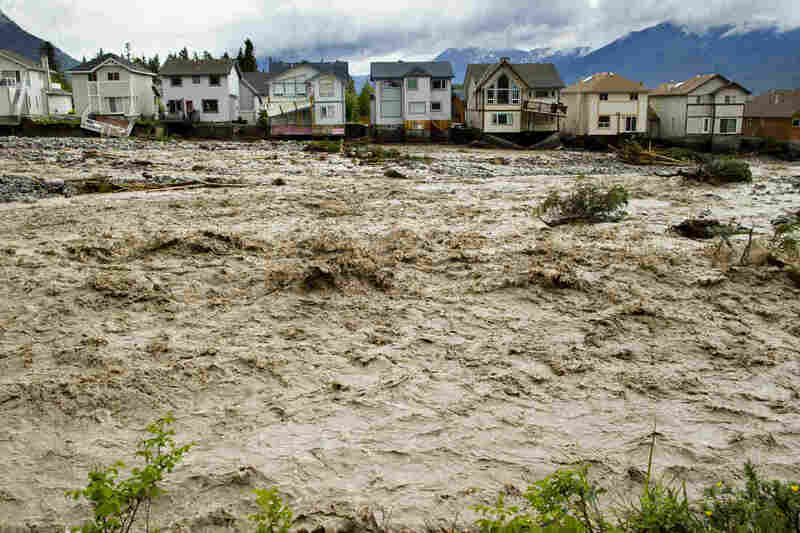 The Calgary Herald reports the flooding could rival what happened during the floods of June of 2005, which damaged 40,000 homes. The paper reports that police went door to door last night asking people in low-lying areas to leave. The Herald says the Calgary Zoo is thinking about moving its big cats to holding cells at the Calgary Court Centre. CTV News has dramatic video coming from smaller communities in Alberta. Residents in Black Diamond told CTV the water rose in a matter of minutes. Some were trapped inside their homes and had to be helped out on heavy equipment. One video making the rounds online this morning comes from Bragg Creek, just west of Calgary. It shows an entire house being dragged by the swollen river until it smashes into an overpass.